U.S. intelligence on Iraq's WMD deserves a second look. So does the reporting of the New York Times' Judith Miller. If the government must re-examine whether data may have been "manipulated" to support the war, surely the New York Times should conduct a similar postwar inventory of its primary WMD reporter, Judith Miller. In the months running up to the war, Miller painted as grave a picture of Iraq's WMD potential as any U.S. intelligence agency, a take that often directly mirrored the Bush administration's view. Now, thanks to the reporting of the Washington Post's Howard Kurtz, we understand why Miller and the administration might have seen eye-to-eye on Iraq's WMD. On the same day as the Times editorial appeared, Kurtz reproduced an internal Times e-mail in which Miller described Ahmad Chalabi, the controversial Iraq leader, former exile, and Bush administration fave, as one of her main sources on WMD. "[Chalabi] has provided most of the front page exclusives on WMD to our paper," Miller e-mailed Times Baghdad bureau chief John Burns. Miller added that the MET Alpha—a military outfit searching for WMD after the invasion—"is using Chalabi's intell and document network for its own WMD work." The failure of "Chalabi's intell" to uncover any WMD has embarrassed both the United States and Miller. As noted previously in this column, she oversold the successes of the post-invasion WMD search. On April 21, she reported in the Times that an Iraqi scientist had led MET Alpha to a site where Iraqis had buried chemical precursors for chemical and biological weapons. "Officials" told Miller this was "the most important discovery to date in the hunt for illegal weapons." Did Miller get taken by sources with an agenda, or did she promote their suspect data for her own ideological reasons? Her Iraq coverage has always relied heavily on Iraqi defectors. To Miller's credit, she often qualifies her defector stories by noting that the CIA doesn't buy what they're selling. In piece after piece, she notes that the agency suspects they invent or embellish their tales to increase chances of winning asylum. But her caveats are usually followed by a passage about how the Pentagon embraces the very defectors the CIA spurns. In Miller's Jan. 24, 2003, story, "Defectors Bolster U.S. Case Against Iraq, Officials Say," neocon hawk and Defense Policy Board member Richard Perle attacks the CIA for its hostility to defectors smuggled out of Iraq by Chalabi's Iraqi National Congress. The CIA, Perle said, had refused to interview the defectors and had undermined their testimony. "But ultimately, the flow of information was so vital and so overwhelming that they could no longer ignore it," Perle says in the piece. One of the named defectors in Miller's Jan. 24 story, Adnan Ihsan Saeed al-Haideri, a civil engineer, told officials that chem/bio weapons labs could be found beneath hospitals and inside presidential palaces. Haideri first aired his allegations to Miller for a Dec. 20, 2001, story. (According to Miller's story, Chalabi's Iraqi National Congress arranged the interview.) No such laboratories have been found, and Miller's original report looks wrong. Miller also authored a provocative Dec. 3, 2002, story about the late Nelja N. Maltseva, aka "Madame Smallpox." Extensively sourced to "senior American officials," "foreign scientists," "American officials," "an administration official," "administration officials," and "an informant whose identity has not been disclosed," the story reviewed the theory that Maltseva may have given "a particularly virulent strain of smallpox" to the Iraqis. No such smallpox program has been found in Iraq, and Miller's original report looks wrong. On Sept. 8, 2002, Michael R. Gordon and Miller wrote in the Times, "Iraqi defectors who once worked for the nuclear weapons establishment have told American officials that acquiring nuclear arms is again a top Iraqi priority." The story catalogs various other threats: An unnamed Iraqi defector claims Saddam Hussein is trying to create new chemical weapons. Iraq will quell another Shiite uprising with chemical and biological weapons, according to Iraqi dissident Abdalaziz al-Hakim of the Supreme Council of the Islamic Revolution in Iraq. Hakim reportedly gave U.S. officials a "paper" from Iranian intelligence that authorized such an attack. These reports have yet to be confirmed, and Miller's original report now looks very wrong. Mr. Shemri said Iraq had produced 5 tons of stable VX in liquid form between 1994 and 1998, before inspectors were forced to leave Iraq. Some of this agent, he said, was made in secret labs in the northern city of Mosul and in the southern city of Basra, which Unscom inspectors confirmed they had rarely visited because of their long distance from Baghdad. He said Iraq had the ability to make at least 50 tons of liquid nerve agent, which he said was to be loaded into two kinds of bombs and dropped from planes. An [sic] former Unscom inspector called at least some of Mr. Shemri's information "plausible." While he said it was impossible to determine the accuracy of all his claims, he believed that Mr. Shemri "is who he claims to be, and worked where he claimed to work." "Shemri's" allegations to date are unsupported by occupation forces, and now Miller's original report looks very, very wrong. As far back as 1998, Miller advanced the case of Khidhir Abdul Abas Hamza, an Iraqi nuclear scientist who defected in 1994. Hamza immediately went to Chalabi for help. Miller and James Risen gave credence to Hamza's claim that the Iraqi nuclear weapons program could quickly be restarted in the salaciously titled, "Tracking Baghdad's Arsenal: Inside the Arsenal: A special report, Defector Describes Iraq's Atom Bomb Push" (Aug. 15, 1998). No evidence of such a "quick-start" nuclear weapons program has been found. Miller isn't a patsy for any stray Iraqi defector who might swim ashore. On Jan. 24, 2003, she reports that both the Defense Intelligence Agency and other Iraqi dissidents rejected defector Abdel Jabal Karim Ashur al-Bedani's testimony about chemical weapons. But none of Miller's wild WMD stories has panned out. From these embarrassing results, we can deduce that either 1) Miller's sources were right about WMD, and it's just a matter of time before the United States finds evidence to back them up; 2) Miller's sources were wrong about WMD, and the United States will never find the evidence; 3) Miller's sources played her to help stoke a bogus war; or 4) Miller deliberately weighted the evidence she collected to benefit the hawks. It could be that the United States inadvertently overestimated Iraq's WMD program. For example, the United States might have intercepted communications to Saddam in which his henchmen exaggerated the scale of Iraq's WMD progress to make him happy. "The country needs to know if the spy organizations were right or wrong," concludes the Times editorial, a fair and equitable stand. But by the same logic, the country needs to know if Miller and the Times too gullibly advanced the WMD findings of their sources—and if so, why. Bomb me with e-mail at . 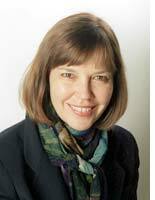 Photograph of Judith Miller courtsey of the New York Times. The Washington Post's Lisa de Moraes writes straight from the spleen. Richard Perle Libel Watch, Week 20. Paging through the Washington PostLite. The wretched reporting of the Times' Judith Miller. The Washington Post's grand plans to give it away. Search for more Press Box in our archive. Apparently I missed this development, thanks Slate. This reasoning is admittedly simplistic, but something stinks here. (1) Chalabi has been pushing for a U.S. invasion of Iraq for years. Indeed, I cannot name an Iraqi national who has publicly been more supportive of the overthrow of Saddam than Chalabi. (2) In a very related vein, Chalabi has been put forward by many in the Administration as the poster-boy for the new Iraqi government. (3) U.S. invades Iraq. Reason? WMD. Or, as the President put it on about 1,050 occasions "to disarm Iraq." Chalabi is airlifted into Iraq by the U.S.
(4) Main source for the NYT stories about WMD is Chalabi? To use the word "dupe" to describe the NYT seems weak. When you add up Wen Ho Lee, Jason Blair, Rick Bragg, and now this, the paper of record is starting to look a lot like a high school paper in need of a faculty advisor....stat. I appreciate that your column is about the press and that your observations about the NYT and Miller are appropriate, but don't you think that the real story is about our intelligence agencies, the defense department and the possible political manipulation of intelligence assessments? After all, the latter, and not NYT stories, were the basis for selling this invasion to the Congress and the people. Shouldn't we, like the annoyed Brits, be calling for our own version of "answer time"? An apt phrase to describe pretty much everything that touched the Iraq war, from Hans Blix to the State Department, to the war protestors, Donald Rumsfeld and to Saddam himself. Did anybody know anything accurate about Iraq before this war happened. And if Shafer's looking for reasons why Judith Miller might lie about bioweapons, how about the fat book she just wrote about them? It's hard to look like an expert when you're getting consistently scooped in the middle of the biggest bioweapons story ever. Iraqi forced to shoot son accused of aiding U.S.